This class reinforced the importance of perspective for me. It's still very challenging for me, but I feel like I have the tools now to improve and produce the kind of work that I'd like to. Thanks for another good one. Pretty good and a lot of fun! I was surprised, TBH. He goes over a few things to really get you rolling with perspective, and reinforce the points of what happens at extreme perspectives, something I sometimes miss. This is my first completed course here. There are two things that I wish he went on a bit further about, namely: The line around a sphere being equidistant from both edges making it a legit midpoint, and another, where he guesses an angle location by having only a single point. This latter part has nothing to do with enjoying the course! A handout of some of his stuff would have made this course stellar. I made my own notes, though. Make sure you draw along! I found this class really useful, as I'm new to drawing same object/characters in different positions and repetition. Will shows some easy steps, important tips to start tacking this , an approach that can be applied to every situation. I loved this class, one of the best of all SVS curriculum in my opinion! Thanks WILL! Even though the topic has been touched in other courses, there is really great information in this course. It definitely makes you look at drawing from a different perspective, no pun intended :). It took more time to find the reference image with matching perspective than it takes me now to just construct the object inside a simple perspective box. this helped out a lot. I wasn't a fan of having the 2nd camera overtop of the instructor while drawing. It felt more in the way than helpful and on some demonstrations it covered up what the instructor was drawing. Overall extremely pleased and thankful to gain more knowledge. Towards the end of this class things began to click for me. I am a novice. I started two months ago taking SVS courses, following the suggested curriculum. There has been plenty of frustration, particularly watching the ease by which the polished veterans demonstrated their skills. This class, however, is the first class where I began to see considerable progress. Frustration is beginning to wane. Although much of the information conveyed in this class was introduced in earlier classes, I appreciated the focus given to the construction of the design prior to sketching. Will's simple, easy to understand instructions and demonstrations conveyed the best piece of information I have learned thus far: think through your sketch by laying out the perspective first. Up until now I thought in terms of the object I was trying to sketch. After watching this class I am finally thinking in terms of shapes and how those shapes exist in three-dimensional space. When learning to write one learns to first outline the shape and order of the ideas and themes one wishes to present; I realize, after watching this class, drawing is no different. If you are experiencing frustration like I was may I offer you this encouragement: persevere and keep practicing; it may not be this class or the next, but at some point things will begin to click. Thank you to Will and the rest of SVS for sharing your gift of teaching as well as your gift for art. Visualizing objects from different views in perspective is a vital skill as an artist to have. A lot of books or tutorials say this, but then give limited or no info on how to practice it. In this class, Will shows us how to practice and build that skill of visualizing objects in perspective from different viewpoints, and it opens up so many doors for creating, composing, and drawing. Awesome class!! Deceptively simple, this course is actually full of tips and aha moments. I left the tutorial with a much better understanding on how to draw things from whatever angle I can think of. This course was absolutely amazing .. I am just a biggener in perspective but I’ve got a good idea about how things should be drawn according to the horizon line as far as size and position It is also very nice to see the construction of complicated shapes. I never thought that making such a complicated shape in the demo could be that easy. Thank you so much for the great class, Will! I loved your simple way of explaining perspective! I love your demo too! Very useful techniques and tips are given here so we can learn how to construct objects in a convincing and accurate way. It makes drawing a little easier and more intuitive! I love this course, I have watched it twice now and both times find myself amazed at my drawings as i work through it. I have a hard time making myself draw by developing the structure, I'm much more into quick and sketchy instead, but I want my art to turn out like it does when I draw through and use structure to build up the piece. This set of videos reinforces to me why i should do it this way, it does strengthen my muscle memory and perception and the results really speak for themselves. I also like them because they are quick and punchy videos and i can get through them quickly. I am astonished at how my drawing has gone from flat and boring to 3 dimensional and dynamic virtually overnight. This class has brought so much of what I have learnt together in one giant ah-huh! moment and I'm now feeling excited as to what I will produce from here. Thanks Will. 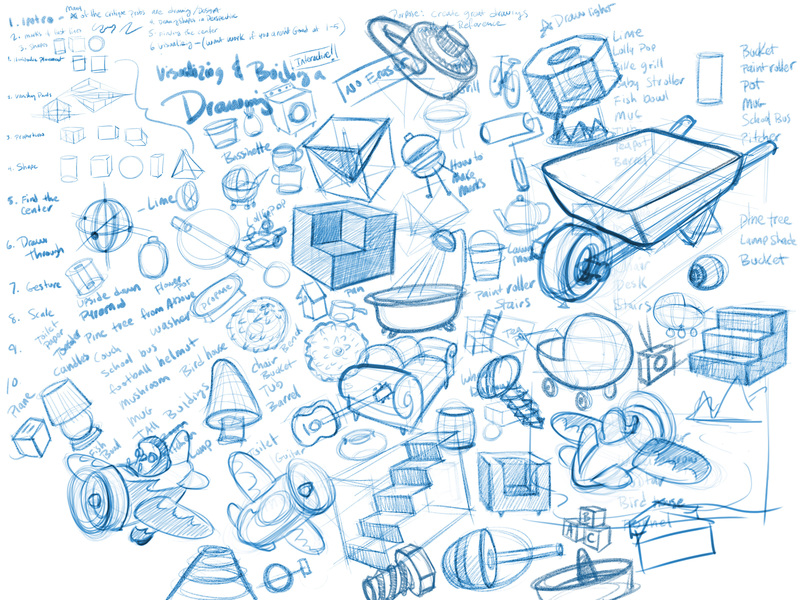 Learn how to imagine objects in various camera angles and build them (draw) from simple shapes. In this tutorial you will be given the steps to draw various common objects from different angles from your imagination. Rather than learning to draw from observation - visualizing is a powerful skill that will fill in the gaps when you can't find the perfect reference photos to work from. Drawing from the shoulder instead of the wrist and fingers. Fast lines vs slow lines. All objects begin from 3-4 simple shapes. Drawing in perspective - rules review. Finding the center line on all objects to give reference points for details. Visualizing an object before drawing it. Applying visualization skills to your own illustration work.